Precision Scale introduced its On2 flex track in one yard lengths in mid-1983. The track consists of an injection moulded tie (sleeper) base strip of 21 ties of random irregular lengths with moulded spike heads holding nickel silver code 70 rails. 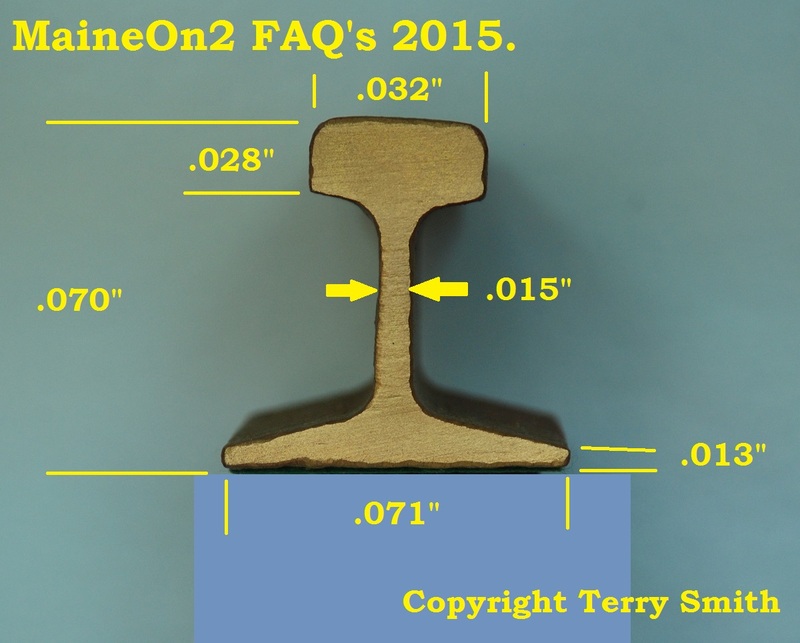 The track gauge typically ranges between .508″ to .512″ on measured samples. The tie base material is believed to be a Delrin type polymer. The dimensions of a typical tie are: 1.279″ long x .153″ wide x .103″ thick on .406″ centres (scale : 5′ 4″ long x 7.3″ wide x 4.9″ thick on 19½” centres). This deliberately foreshortened view of the track clearly shows the irregular tie ends. The yellow arrows show the length of one of the tie strips. The dimension from the inside edge of the bottom of the rail to the outside of the tie varies from .377″ to .419″ on one side and from .374″ to .422″ on the other. This underneath view shows the single bars connecting adjacent ties. Experience has shown that care needs to be taken when laying this track to ensure that the ties are as perpendicular to the rail as possible, and not angled, to avoid reducing the gauge of the rails. This is especially important on curves, and when running the larger Forney type locomotives. This series of pictures aims to illustrate a/. the difference in size between a 1/4 inch scale model of a Maine Two Foot boxcar and a typical ready to run boxcar in On30, and b/. 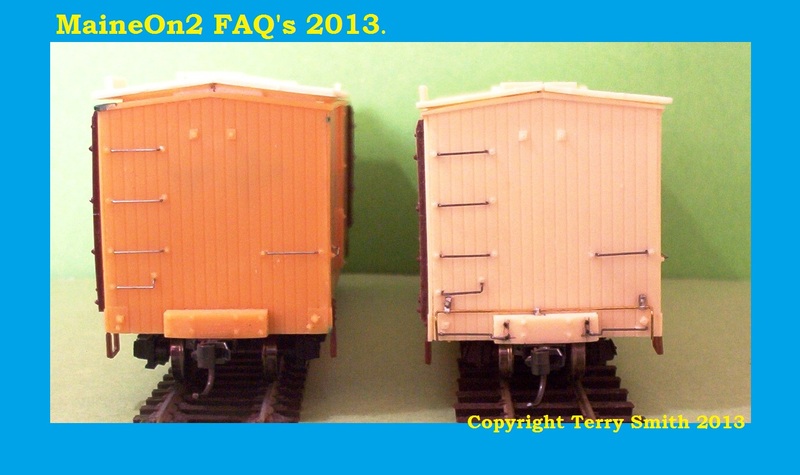 the difference in ride heights between the same model boxcar built as an On2 model and one built to the common standards applied to On30. The very low, close to the ground appearance of the On2 model is apparent in this shot. It is commonly stated that the body of Maine Two Foot freight car should overhang the trucks “like a well upholstered lady sitting on a bar stool”. This shot also shows Trevor Marshalls’ method of simulating the seamed roof appearance using “tiles” of thin metal foil applied individually. Note that the latest research shows that all Maine Two Foot boxcars were built with tin roofs made from overlapping sheets, although the sheet size, laying patterns and method of attachment to the sub-roof did vary with builder and road, and sometimes build dates. 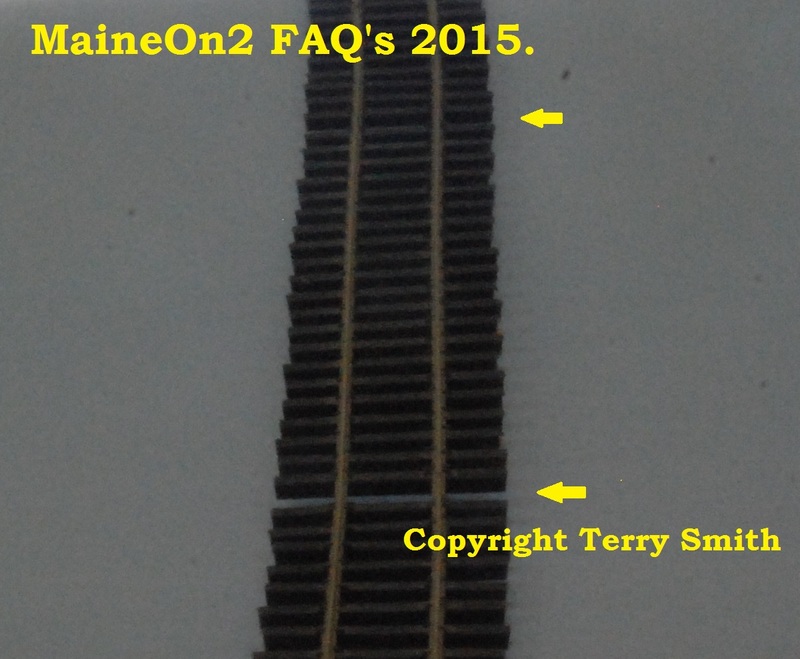 These two pictures show the same boxcar model, a B&SR 26 footer scratchbuilt by Terry Smith from his own urethane parts, built to common On30 standards on the left and to On2 standards on the right. 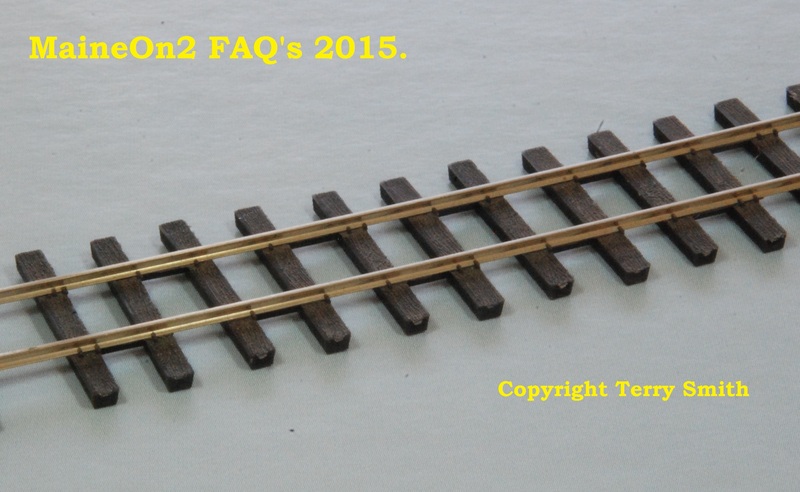 The On30 model is shown on standard UK OO gauge train set track (his nephew’s) while the On2 model is shown on Precision Scale On2 Flex track. The On30 model is shown with an early style urethane roof casting with rather pronounced raised seams (taped), whereas the On2 model is shown with a later style urethane roof casting with more subtle seams (embossed).